Before, this Norwalk basement had cold, porous walls that let in lots of air and moisture. These walls were an eyesore and made the basement uncomfortable. Wanting a solution for their damp and chilly basement, the homeowner decided to contact Dr. Energy Saver of CT! After, Dr. Energy Saver of CT was able to solve all of this homeowner’s concerns by using our patented products. BrightWall panels were installed on the walls of the basement to prevent water vapor and moisture entry. This product is both practical and beautiful. The BrightWall panels made the area look and feel more welcoming. This is exactly what the homeowner wanted and they were thrilled with the transformation and results. In the end, our customer was very happy that she contacted the experts at Dr. Energy Saver of CT! Before, this Norwalk basement was completely under insulated, which caused a lot of air leakage. The constant drafts and air flow made the basement very uncomfortable. Wanting a solution, the homeowner decided to reach out to the experts at Dr. Energy Saver of CT.
After, the experts at Dr. Energy Saver of CT were able to provide a solution by installing spray foam insulation to prevent air and moisture from flowing through. Spray foam is a great option for insulation because it has a high R-value (between R-6 and R-7.1), has complete coverage and is waterproof! Just look at this transformation. Now, this basement is completely insulated, keeping the home at peak efficiency! Attic and crawl space insulation. Large crawl space is bare with no insulation or barrier. Attic is not air tight and I believe original insulation and it was built in the 50's. Check out insulation -- looking to cost effectively improve heating costs with insulation. Our office and powder room share a wall with the garage and are freezing in the winter and warmer in the summer. The powder room also has a problem with the pipes freezing. Not sure if it's due to an exterior wall or an issue with insulation of the pipes in the basement area. I'm interested in getting a quote for air sealing and making our home more energy efficient ahead of approaching winter. Completed the job and cleaned up nicely! The Doctor who came out to our Norwalk home was able to visually show us the places heat was escaping and offered solutions to make our home warmer and more enegry efficient. "I can't say enough about Rudy and his crew. Even before the..."
"Johnny Lopez and his cre were highly professional, helpful,..."
At Dr. Energy Saver Of Connecticut we put customer service first and are proud to serve our area. Our team of trained technicians use only high quality materials from the best manufacturers in the business to ensure that you get only the best results. Let us put our expertise to work for you to find the best solution for all your home insulation and air sealing needs. It is a fact that most homes have energy problems because of an insulation problem in their attic. When there is an inadequate amount of insulation in an attic, heat can seep out of it in the winter time which can make for a very uncomfortable living environment. By installing our SuperAttic system, you can get an affordable upgrade for you attic that will be sure to keep heat inside your home in the winter time and cool air in during the summer. In addition to our SuperAttic system, we also offer spray foam insulation to keep all those nooks and cranies of your home well insulated. Spray foam has a superior R-value to rigid foam like that in SilverGlo insulation and creates an effective air barrier. Though rigid insulation is great for areas like basements and crawl spaces, spray foam is better suited for attics because it can expand with the different temperatures and fill in little gaps where air leaks out. Heat can leak out of your home in various ways, but the most common is through cracks in the floors and ceilings. From there, air can leak out of an insufficiently insulated attic and outside. This is called the "stack effect" and as warm air rises, leaving your home, your poor insulation and small air leaks are costing you a fortune in energy bills. 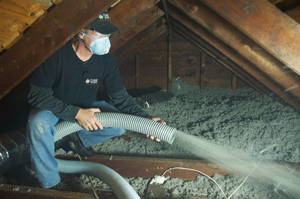 With our home insulation techniques, we can pinpoint which areas of your home are leaking air and fix them. Because of their location in the home, crawl spaces are often the main culprit to cold air leaking into your home in the winter time - but it's not their fault! Crawl spaces frequently are poorly insulated and tolerate small cracks that leak air into the rooms above it. By insulating your crawl space, you can cut down on energy costs and make you home a more comfortable place. One of the little-known dangers of heat leaking out through the roof of your home's attic is ice damming. When heat escapes your attic through the roof in the winter time, it melts the snow on your roof, causing the water to go down into the gutter and freeze. When this happens repeatedly, it comes to a point when the water is still on the roof and therefore doesn't melt and becomes dammed up by the ice in the gutter. This water then leaks back into the house through the roof causing all sorts of other problems. The way to prevent ice damming is by properly insulating and air sealing your attic so that heat doesn't escape in the first place. Windows and doors can be a huge cause of energy leakage in your home, costing you more money than is necessary to keep your home at a comfortable temperature. By investing in replacing your doors and windows, you get our expert technicians who measure your windows and doors to make sure that everything we install is a perfect fit, eliminating gaps and cracks that leak out air. 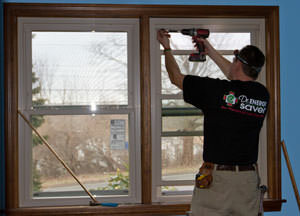 Dr. Energy Saver Of Connecticut has the tools and the expert precision to get the job done right the first way. We understand the struggle of paying too much for energy bills and still not feeling comfortable in your home which is why we are committed to customer service - we want to find a solution that will work best for you! Call us today for a free estimate! SilverGlo panels are used on the walls to keep insulation secure and prevent any unwanted airflow from entering the basement. Our SilverGlo rigid foam insulation is durable, waterproof, and won't lose R-value over time! Our CleanSpace Vapor Barrier was used on the floors and wrapped around the posts to act as a deterrent against unwanted air and water vapor intrusion. This 20 mil thick, poly-reinforced liner is also mold and mildew resistant. The SaniDry Sedona dehumidifier was installed to keep humidity low and to prevent any odors or mold growth. It also stops dust mites and can even help relieve symptoms of asthma and allergies! This Norwalk homeowner noticed that her basement was cold and drafty, causing the main floors of her home to become uncomfortable. Wanting her home to run efficiently, she called the experts at Dr. Energy Saver of CT to help find her a solution. On the day of the appointment, Sales Representative Don Godbout arrived at the home to inspect the basement. He concluded that the basement was under insulated which was the cause of the drafty area. When an area is under-insulated, air and moisture is able to move freely in and out. This air leakage not only makes the home less energy efficient, but it also causes a higher electric bill. After explaining the problems, Don proposed a solution by installing insulation and air sealing the basement to prevent air leakage. This is exactly what the homeowner had wanted and decided to move forward with the project. On the day of production, Rudy Abel and his team installed BrightWall to the walls of the basement and air sealed the rim joist with Spray Foam. First, the rim joists of the basement were insulated with spray foam. The spray foam will prevent any air from leaking out of the basement, ensuring that the heated air you pay for stays in your home! The BrightWall panels are great to brighten any basement and the product is also strong and durable, not maintenance require. The homeowner was very pleased with the transformation and quickly noticed a difference for the better! This Milford basement was completely under-insulated which was causing the entire home to become energy deficient. The homeowner was tired of paying for a high utility bill when the air she was paying for was literally going out the window. She wanted to put an end to this problem and decided to call Dr. Energy Saver of CT for a free home evaluation. On the day of the appointment, Sales Representative Keith Saunders arrived at the home to give a free inspection. He concluded that the home would need to be properly insulated with SilverGlo and Spray Foam. This will solve the air leakage problem by keeping the air that you pay for in the basement at all times by sealing all cracks and holes. CleanSpace Encapsulation was also recommended to prevent any air moisture from seeping through the basement. Lastly, a SaniDry Sedona will keep humidity low which will prevent mold growth. The homeowner agreed that this would be the best solution for her basement concerns and scheduled for a production day. On the day of production, Johnny Lopez and his team installed all the products proficiently and efficiently. The entire basement was transformed and now the homeowner can enjoy a comfortable and energy efficient home all year around. Need insulation attic and basement. Would like to eventually finish off attic. We recently purchased our home and our thermostats need to be adjusted and we need to add a zone. Also had an energy assessment and they recommended more insulation, which makes sense because we are having trouble regulating our temp this winter. Our house is old and would like it evaluated to determine where we might be loosing energy. Home is raised. When temps get really cold feel air coming in house off floor/walls. Have blown in insulation under home. Want to see options for reducing cold air entering. Uneven air flow. I was a CT basement customer when I had a crawl space.